Christian Wolff (Ben Affleck) is a math savant with an almost superhuman affinity for numbers. After working as an accountant for some of the world’s most dangerous criminals, he has come to the attention of the US Treasury Department’s Crime Enforcement Division, run by Ray King (J.K. Simmons). As a result, Wolff decides to take on a legitimate client. Dana Cummings (Anna Kendrick), an accounting clerk for a robotics company, has found a troubling discrepancy involving millions of dollars. However, as Wolff starts to uncook the books, he discovers a conspiracy that threatens Dana’s life and his own. The Accountant is the entertaining, if flawed, new action drama from director, Gavin O'Connor. This film boosts an impressive cast. Let's face it, any film featuring Ben Affleck, Anna Kendrick, J.K. Simmons, John Lithgow and Jeffrey Tambor is going to be at least partially entertaining - regardless of its plot. In addition, The Accountant teases us with its mysteries. Who is Christian Wolff? Where did he come from. What has he done? Why is Ray King so intent on finding him? And, what lies behind those financial discrepancies at the robotics company? Thus, The Accountant dangles a number of enticing narrative threads in front of us and we lean forward, eager to see just how these threads pull together. 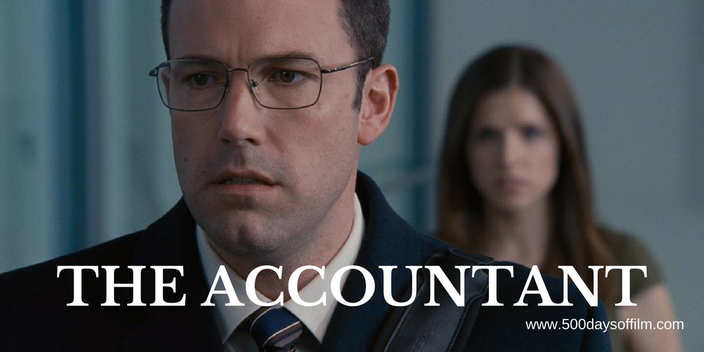 Sadly, The Accountant makes a real mess of its narrative mid-way through - entering what I like to call its “who the what now?” phase. From here on nothing makes sense - plot, characterisation, the twists and reveals - nothing. O'Connor then dispenses with the criminally underused Kendrick and moves into all out action and violence. It felt reminiscent of John Wick, but no way near as entertaining. narrative together. I wouldn’t bother. This is not a film that rewards that much thought. However, if you check your brain in at the door and gloss over the gaping plot holes, The Accountant is an entertaining, if ultimately forgettable film with likeable and engaging performances. Seriously, no one could come up with a more exciting film title? Mainstream Hollywood often prefers to view autism as some kind of superpower whose challenges wax and wane - dictated by the plot and not the condition. Christian Wolff, meet Bruce Wayne. Gavin O’Connor also directed Warrior with Tom Hardy, Joel Edgerton and Nick Nolte. In my view, this film (about two brothers fighting in a mixed martial arts competition) is a superior, more satisfying film. Have you seen The Accountant? If you have, what did you think of Gavin O’Connor’s action drama? I would love to know - leave me a comment in the box below!